2016 Ford Escape at Beach Automotive! Compact crossover SUVs are great for many things, be it commuting to work, taking your kids to school, loading up goods from Costco or going on a ski trip. Often lacking, however, is any sense of fun. To get that, you’ll want to check out the 2016 Ford Escape. Based on the engaging Ford Focus, the current Escape drives like a Focus on its tiptoes (that’s a compliment) and, when fitted with the turbocharged 2.0-liter engine, it’s one of the quickest small crossovers in this price range. Moreover, the Escape earns its crossover stripes with optional all-wheel drive, respectable fuel economy, a spacious cargo bay and an available hands-free power liftgate with a super-cool foot sensor. The 2016 Ford Escape is a compact crossover SUV that comes in three trim levels: S, SE and Titanium. Standard features on the S include 17-inch steel wheels, an integrated blind-spot mirror, MyKey parental controls, full power accessories, keyless entry, cruise control, air-conditioning, a tilt-and-telescoping steering wheel, a height-adjustable driver seat, a 60/40-split folding and reclining rear seat, a 4.2-inch central display, a rearview camera, the Sync voice command electronics interface with AppLink smartphone integration, Bluetooth phone and audio connectivity and a six-speaker sound system with a CD player and a USB port. 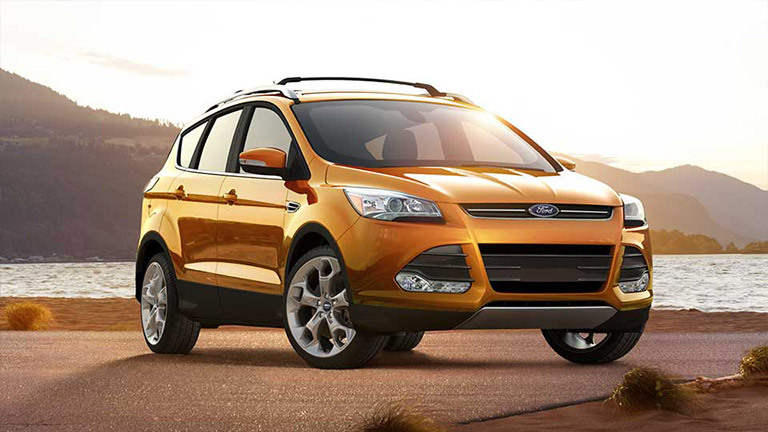 The 2016 Ford Escape offers no fewer than three engines, with availability dependent on trim. A six-speed automatic transmission and front-wheel drive (FWD) are standard across the board, while all trims but the S are available with all-wheel drive (AWD). Antilock disc brakes, traction and stability control, front-seat side airbags, a driver knee airbag and full-length side curtain airbags are standard on the 2016 Ford Escape. Ford’s MyKey (enabling owners to set electronic parameters for younger drivers), a rearview camera and blind-spot mirrors are also standard. A blind-spot warning system with cross-traffic alerts is optional on the Titanium via the Technology package. 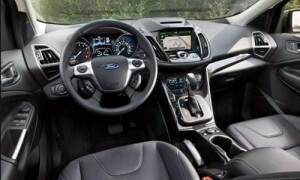 Inside the 2016 Ford Escape, you’ll find plentiful soft-touch materials and generally impressive fit and finish, though there’s not as much storage space for personal items as you might expect. The front seats are well-shaped and generously padded, while the gauges are large and easy to read. Some controls are a little hard to use. You have to reach down low to find the climate-control panel, and the standard audio interface frustrates with its small display screen and sea of similar-looking buttons. More promising is the new Sync 3 system that replaces last year’s MyFord Touch interface. We’ve yet to fully test it, but we expect the system’s larger menu icons and quicker processing times will improve the experience substantially. 0 comment(s) so far on 2016 Ford Escape at Beach Automotive!